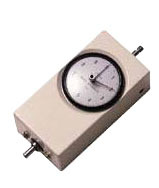 The UK series mechanical force gauge is a dedicated compression only or tension only intrument for use in confined spaces, or for permanent installation into a piece of equipment or machinery. The specially designed dial will retain peak values while simultaneously displaying real time measurements. The threaded shaft will accept any of the standard FB/PS replacement measuring attachments. Dedicated compression and tentsion ranges are available for your specific needs. Newton gauges are available.